We have the DGE Customer Success Assessment™ designed for businesses who want turn Customer Success Management into a growth engine. Simply complete the online questionnaire of key twenty-five researched and proven key competencies. 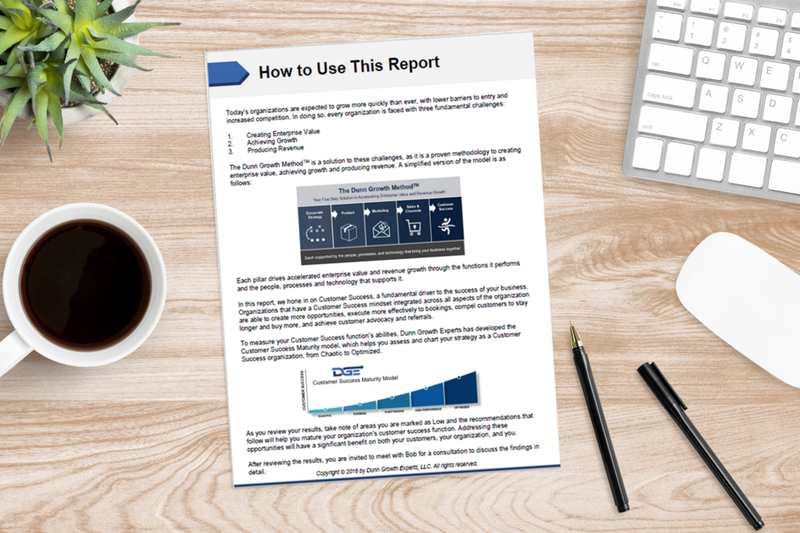 Within minutes you will receive a comprehensive 30-page report with your results for each of the twenty-five key capabilities compared to DGE’s industry benchmarks and three targeted recommendations for each, plus we show where things stand and pinpoint your current capabilities on the DGE Customer Success Maturity Model™. You also have the option to frictionlessly schedule a convenient online meeting with Bob to discuss the findings and performance improvement recommendations that will turn Customer Success Management a growth engine.